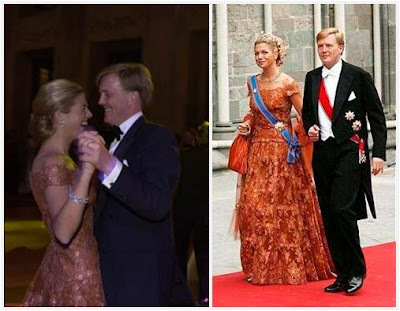 Next week marks ten years since the Prince of Orange married Máxima Zorreguieta (on 2-2-2002, in case you forgot). Since I've already blabbered on about my love for my favorite modern magpie's wedding gown, we're celebrating in another way: with her wedding guests. First up, the black tie party from their pre-wedding events, which drew a whole mess of royal friends. Unfortunately, not all of them brought something to talk about, particularly. I mean, 'twas the times. Blergh. Some of these appearances are more remarkable for the differences from today, no? (Oh, the sands of time, etc., etc.) I mean, look at Mette-Marit there with half a feather boa strapped on the definition of plain. A transformation in progress to be certain. Moving up on the scale of memorability: color! Bless Princess Sarvath and her luscious and rich purple and gold. ﻿﻿Some appearances were memorable for being maybe a little bit out of character, like Paola and her extra poufy sparkly affair, Anne-Marie and her Cinderella costume, or Sophie and her Vegas turn. And others are memorable for being out of this planet...oh, M-C! That's a lot of pea green doilies, my friend. She was dressed by Valentino, who also dressed the best of the evening (as it should be): the bride. Máxima's dress that night (which we got to see in full view later that year at Princess Märtha Louise's wedding) might just be the only time orange and lace end up married together on my favorite outfit list. A sure sign of the divine bridal creation that was to come. Who do you think was best dressed at the pre-wedding party? Next week: the guests go to the actual wedding.